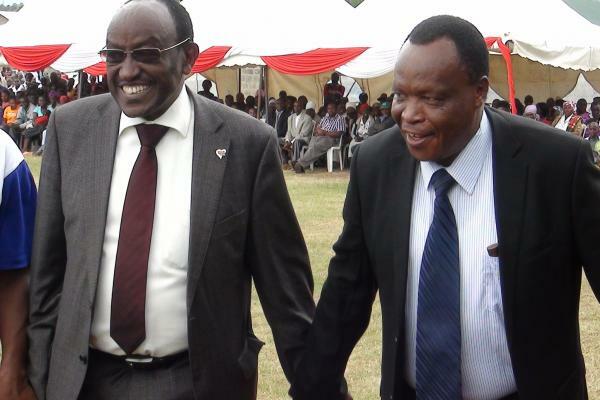 Nyandarua Governor Daniel Waithaka has denied claims that he has been visiting a woman bishop at night. He said that he was shocked by the false reports that have been going rounds claiming that he has been sleeping with the bishop. According to reports, a crowd stormed into bishop Rahab Muthoni of GECK church in Engineer town claiming that the governor was holed up there. “I wish to state categorically that at no time was I in the vicinity of Bishop Rahab’s compound as claimed by Inooro FM Radio,” he said. The governor claims he was at home in Nyahururu when the people stormed the bishop's house claiming he was sleeping with her. He claims that the crowd was sent by his political enemies who want to destroy him politically. “Why would a crowd of people storm the bishop’s house, yelling and shouting that I leave the compound, yet I was nowhere in sight?” Waithaka said. During his speech, Waithaka singled out Inooro Fm journalist Harun Njoroge, saying he was behind all the rumors and he is a man of a questionable character. Although Waithaka did not mention about taking any legal step, he asked why the reporter rushed to file the report without seeking his comment first.